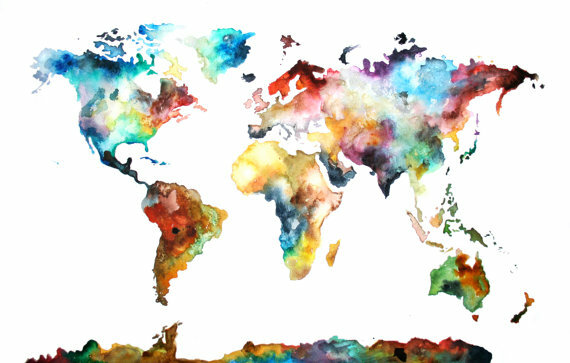 Here's how you can, with absolutely no artistic ability, create our own watercolor map! If you don't have Photoshop, see if your local library or college campus does. a. Find image online of watercolors (or any kind of pattern/painting that tickles your fancy). You will want to make sure you have permission to use someone else's artwork. A good place to find stuff is the "Creative Commons" on Flickr.com. b. Paint something yourself and scan it onto your computer. Really you would just need to paint blobs in pretty colors. 3. Find the map you want to use. It could be a state, country, whole world, whatever. I used this one. 4. 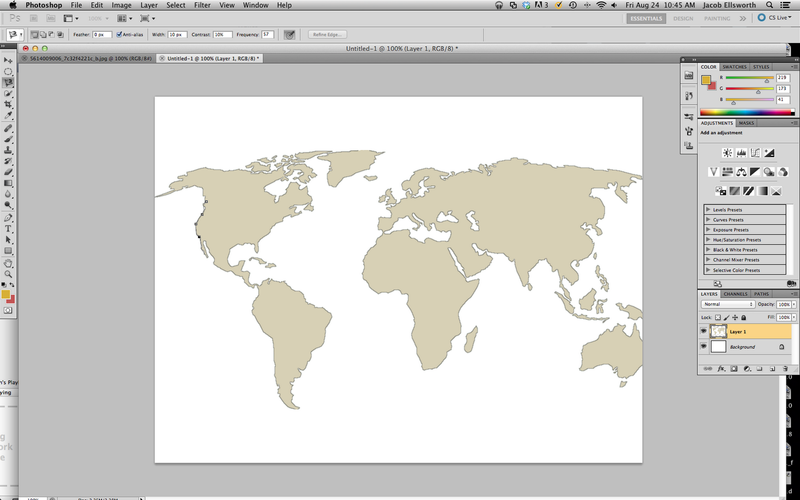 Go back to Photoshop, open a new document and paste the map into it. 5. 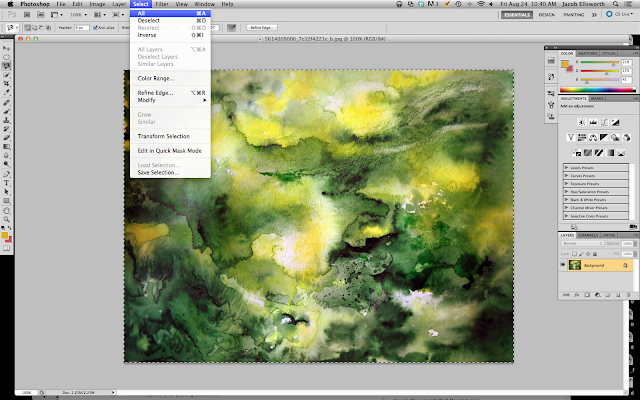 You should now have 2 tabs in Photoshop: one with the painting, one with the map. Click back to the painting one, then at the top choose Select: All. 6. Click back to map image, hold the lasso tool and choose the magnetic lasso. If you're not familiar with the lasso tool, you can watch this. It's really easy, though. 7. Outline one section of the map and close it off (should have dashed line around it). If you're doing a map of the world or anything with lots of islands, lakes, etc. you really want to do it in small chunks (what a gross word). 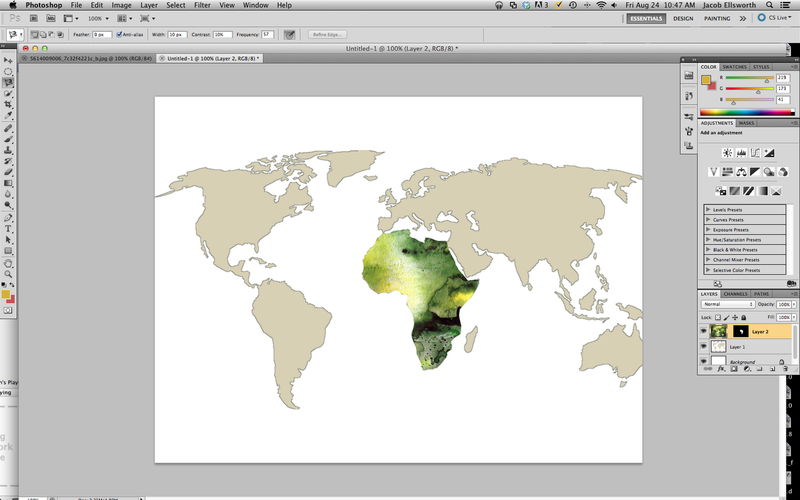 There are so many possibilities with the types of map, painting, patterns you could use with this tutorial. If there's a state or country special to a loved one, this would make a cute personalized gift. I'm excited to experiment! That is a great quick solution. Gotta love Photoshop and I love "Paste Special!" It looks so great! Du you print it in sections and glue it together? Thank you for the tutorial. Your map is beautiful. I am a follower of your blog and would love if you could take some time and come check out my blog (http://sarahsaturdiy.blogspot.com/) and share some of the blog love! Have a great week!